2. Onion So Strange It Might Be from Mars! In Sitka, Alaska, one of the most revered members of the community is the thorny devil’s club. But the plant’s popularity as a medicinal may endanger its sacred role in Tlingit culture. The Tlingit have turned to devil’s club for a list of ailments you wouldn’t wish on an enemy: from coughs and colds to stomach ulcers, tuberculosis and hypoglycemia. Tribe members steep it into teas, mash it into salves, chew, sip and steam it. It’s also used to ward off evil. The plant, dubbed the "Tlingit aspirin" has not been approved for medicinal use by the Food and Drug Administration. Devil’s club, or Oplopanax horridus, is a plant with an unmistakable presence. It has leaves like palm fronds, spines like daggers and red fruit that’s candy for bears. It sticks its long neck out as far south as Oregon, and to the east, has even surprised a few Michigan hikers with its cloak of vicious thorns. But the plant is perhaps most common to the bear, deer and salmon habitats of Alaska’s Tongass National Forest. Growing undisturbed among 500-year-old trees, devil’s club runs with abandon. It scampers up and across these spacious, wild woodlands, where the conifers are so widely spaced that the sun pours right in, and right through the plant’s open-palmed leaves. From a distance, devil’s club looks enticing; its foliage, balanced on top of long, leggy canes, seem to offer an almost tropical respite. But a close encounter with the plant is one you’re not likely to forget: spines cover every inch of its stem, and punctuate the undersides of its leaves. "Artery-size veins create deep channels in the blade, like a landscape scoured by rivers. The tissue in between the veins is itself puckered and textured, and the leaves, arrayed as they are on very long petioles, create the impression of a rich green quilt that is just singing with design possibilities." Devil’s club is reliably hardy to minus 20 degrees, though it’s not all that tolerant of heat and sun. Gardeners who want to try it might keep in mind its natural habitat: damp forest floors with moist, acidic soil. With its bulbs crazily arranged on top of the plant, not at the base like ordinary onions, the Egyptian onion (Allium x proliferum) might well have been named ‘Martian onion’. 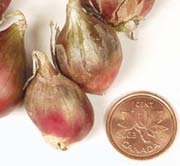 Its bulbs the size of a penny possess a wonderful flavour and are excellent for pickling and for seasoning soups and stews. Egyptian onion is the easiest onion to grow. It is a perennial, hardy in zones 4-9, and will produce annual crops of bulbs starting next summer. Clumps will increase in size with each season without much effort on your part. 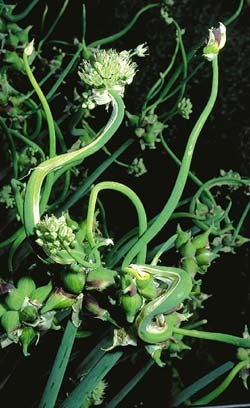 You may even witness the ‘walking onion’ effect as heavy bulb-laden scapes topple over and produce new clumps where the bulbs touch the soil. Egyptian onion prefers rich garden soil in a sunny location. Plant bulbs 60 cm (2 ft) apart. The tips of the bulbs should just peek through the soil. Press the soil firmly around each bulb and water. Keep evenly moist until plants are well established. For the first winter protect plants with a mulch of dead leaves or straw applied in late fall. Next summer bulbs will be ready to pick when they turn brown. Use them fresh, or dry them for later use. Store them as you would garlic or onions. The fresh leaves are edible too  use them as green onions. Much as we love our feline and canine friends, they can be a royal pain in the you-know-where when they carouse in our gardens. They romp around damaging plants, dig holes, and otherwise ‘do their business’ where they shouldn’t. But dogs and cats (and rabbits too) stay away if a Piss-Off Plant is nearby. For some reason not yet understood, furry critters absolutely detest the odour of this plant and won’t go near it. When planted three feet apart, the Piss-Off Plant will protect a whole garden. Surprisingly the plant is not offensive to humans, and it does not harm children or pets. And it has succulent leaves and attractive lavender flowers and makes an impressive easy-to-grow plant for hanging baskets and indoor windowsills. The Piss-Off Plant was developed four years ago in Germany when a Plectranthus canina plant was crossed with a Plectranthus esculentus plant. The goal was to produce an ornamental plant with compact growth habit. It was only later that the plant’s unique animal-repelling property was discovered. The HerbzAlive newsletter is written and published by Richters staff. ©2004 Otto Richter and Sons Limited. All rights reserved.